Today, the Peace Corps announced that Hope College ranked No. 22 among small schools on the agency’s 2018 Top Volunteer-Producing Colleges and Universities list. There are 10 Hope alumni currently volunteering worldwide. This is the first year since 2009 that Hope College has appeared in the rankings. Alumni from more than 3,000 colleges and universities nationwide have served in the Peace Corps since the agency’s founding in 1961. Since 1961, 198 Hope alumni have traveled abroad to serve as volunteers. In 2017, the state of Michigan ranked No. 9 among states with the highest number of Peace Corps volunteers with 266 volunteers currently serving worldwide. One Hope alumna currently making a difference is Big Rapids, Michigan native Lindsey Hall. After earning her bachelor’s degree in political science and international studies at Hope College in 2007 and a master’s from the University of Colorado Denver in 2011, Hall began service as an education volunteer in Uganda. As an education volunteer, Hall has worked in various positions during nearly four years of service including as a literacy specialist, teacher trainer and a Peace Corps volunteer leader. She currently works with the “Save the Children” program as an education support specialist. 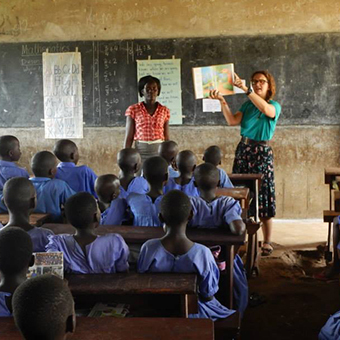 In Uganda, Hall has supported literacy efforts at the primary school level, and facilitated professional development sessions to teach effective education methods and ways to create safe, friendly learning environments for children. She has also provided technical support for Uganda’s “Primary Literacy Project,” trained local women on menstrual health and re-usable menstrual materials, and worked with “Save the Children” in response to the South Sudanese and Democratic Republic of Congo refugee crisis. After she completes her Peace Corps service, Hall plans to pursue a second master’s degree or a doctorate in education. About the Peace Corps: The Peace Corps sends Americans with a passion for service abroad on behalf of the United States to work with communities and create lasting change. Volunteers develop sustainable solutions to address challenges in education, health, community economic development, agriculture, environment and youth development. Through their Peace Corps experience, Volunteers gain a unique cultural understanding and a life-long commitment to service that positions them to succeed in today’s global economy. Since President John F. Kennedy established the Peace Corps in 1961, more than 230,000 Americans of all ages have served in 141 countries worldwide. For more information, visit peacecorps.gov and follow us on Facebook and Twitter. My wife, RuthAnn (Sjölin), and I are 1968 graduates of Hope. We served in an education program in Kenya from October, 1968 to March, 1971. Our marriage survived (many others did not) that life changing experience! One of my brothers (Central College in Pella, IA) also served in Kenya and one of my sisters served in Thailand.